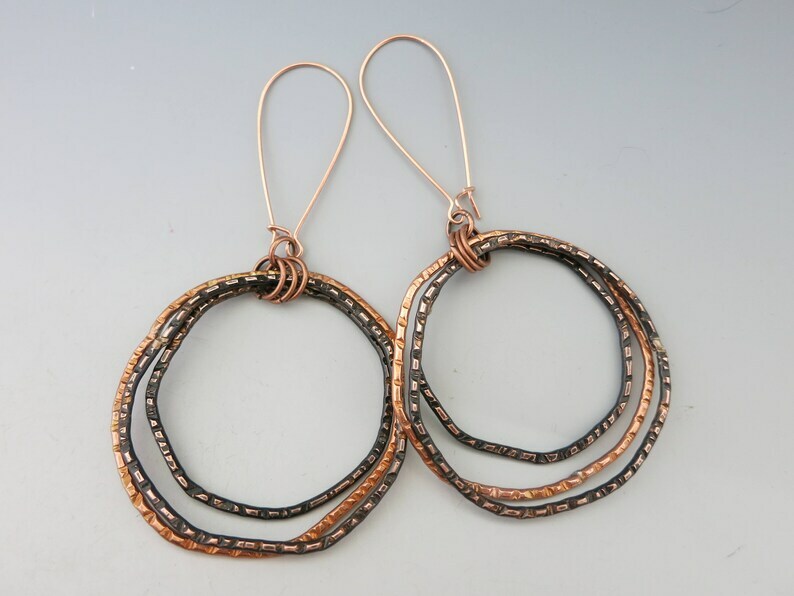 Each earring has 3 of my handmade hammered copper hoops - slightly irregular in shape and size. Some a flame treated copper and some are darkly oxidized. Then sealed to protect them and hung on copper kidney earwires - which I like because they latch to keep from falling out. the hoops are roughly about 1 1/2" diameter and the drop from the top of the earwire is 3". These earrings are ready to ship and I usually ship within 24 to 48 hours. All of my handcrafted, one of a kind jewelry comes in a natural brown gift box, and ship by USPS First Class mail. The earring card shown is not included.